Thank goodness Dawn, Ian, Jillian, and Andrea answered my call for photos from Nora’s My Little Pony birthday party, since I didn’t get my camera out even once. I do wish we had a photo of the great pony cake Jen made, topped with clouds of cotton candy and silver-sprayed horses. 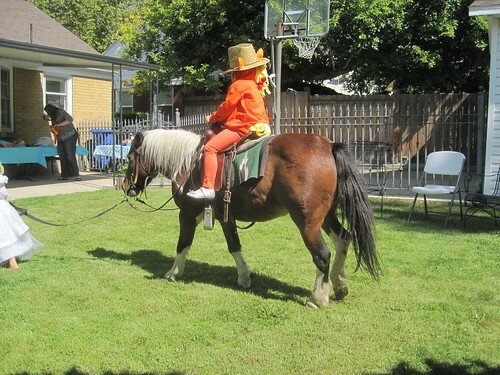 The biggest hit was the real, live pony, Annie–a surprise for Nora. Pony Haven dropped her off for three hours, and we got to lead her around, give all the kids rides, and feed her anything we wanted. She was great. We also let all the kids paint Nora’s tattoo parlor, Valori did some amazing pony-themed face-painting, and my mom and Dawn brought some delicious food. Maureen and Jennilyn helped me put up all the decorations, and everyone brought Nora such fun gifts. Thank you, everybody!! 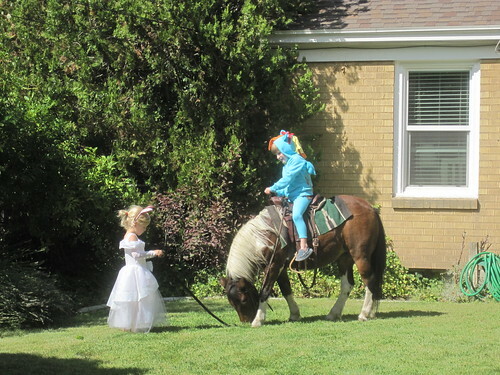 Here are two of my favorite photos, which show the Rainbow Dash and Apple Jack costumes a little bit better. Nora’s birthday wish was that she and Alex could have homemade pony costumes to wear at the party, so I put those together (and now she has some awesome pony dress-ups to play with any time). I wish you could see the cutie marks and other details better. This entry was posted in Alex, Birthday, Lisa, Photo Album, Rylee by lisa. Bookmark the permalink. Really, really good mom-ing, Lisa. Your girls are so funny. We have enjoyed watching the videos and looking at their photos. They are adorable! Hope all is well!